Cobblers chairman Kelvin Thomas has confirmed Rob Page is in talks with clubs about signing players on loan for the new Sky Bet League One season, but has urged patience as the Town boss puts the finishing touches to his squad. Thomas is confident the club will get the players they want, but says the changes to loan rules this season means parent clubs are having to be extra cautious when it comes to releasing players. Loans must now be for either six months or the full season, and clubs, whether it be Premier League or Championship, are simply waiting to make sure their squads are in order and up to strength before releasing players. “We have been talking to a few clubs about a couple of loan players coming in for the new season that Andy (Melville) and Rob have got their eye on,” said Thomas. “I think with the loan players it is a bit harder this year, because of the rule changes in the loan market. “So clubs are waiting a little bit longer, as the Euros have affected their players coming back, so some of the clubs we are talking to are taking their players on tour, but then expect to get them out. “We are being patient. As Rob has said consistently, the squad is very good as it is, but we know we have to add probably a couple of wide players and a forward into the group. 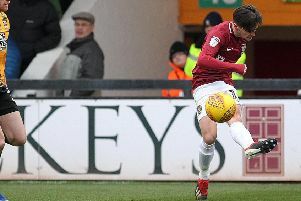 As it stands, the Cobblers squad is 20-strong, but is a little light in the attacking department, with neither Nicky Adams or Ricky Holmes being replaced after they left the club, while Alex Revell is the only centre forward who has been brought in following the departure of loan players James Collins and John Marquis. Thomas added to ntfc.co.uk that it could be the middle of July before their targets are acquired. “Over the next 10 days to two weeks we will be looking to tie down a couple more, and push them into the squad,” he said.